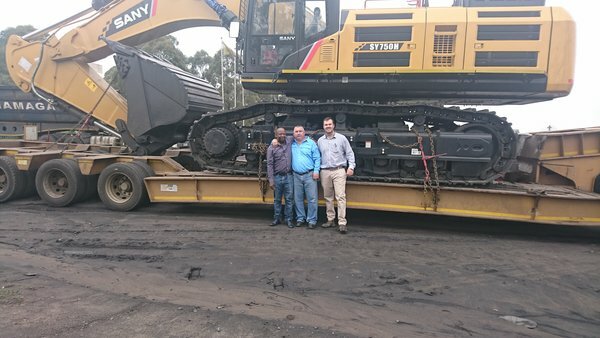 Mining-services company E&J Construction of eMalahleni has acquired a SANY SY750H excavator from Goscor Earth Moving (GEM) for a coal strip-mining contract in Mpumalanga. The giant 75 t excavator is the latest addition to the extensive fleet of SANY equipment owned by E&J Construction, which includes two SY956H front-end loaders, a SMG200 grader, a SY500H excavator, and a SY335 excavator. Director Jerry Mnisi reveals that the company plans to supplement the SY750H excavator with SANY rigid dump trucks in order to be able to offer its client a total mining solution. “Our relationship with GEM extends to about 2013, which is testament to the high regard in which we hold the SANY brand,” Mnisi comments. He adds that GEM MD Barry Owen has been instrumental in assisting E&J Construction with its procurement strategy over this period, facilitating finance and strengthening its aftermarket support and technical back-up. “What has been of great importance to us as a client is that GEM forms part of the larger Goscor Group, which gives it significant leverage in a highly-competitive marketplace,” Mnisi adds. Director Eugene Geldenhuys stresses that the Goscor Group is particularly supportive of up-and-coming businesses like E&J Construction. GEM eMalahleni Sales Executive Lee Sampson explains that the long-standing relationship with E&J Construction is based on the value-for-money and high quality offered by the SANY brand. The introduction of the SY750H now allows GEM to service the entire spectrum of the mining industry, from primary loading to opencast and even alluvial diamond mining, as well as stripping top soil and free digging. The SANY SY750H features an Isuzu 6WG1X engine, with a maximum torque of 2 138 Nm at 1 500 rpm. “The Isuzu engine brand, known for its durability and fuel economy, is an integral part of SANY’s strategy to source only the best components for its equipment. For example, Kawasaki pumps are also used to ensure constant hydraulic flow,” Sampson highlights. In addition, the SANY SY750H boasts a self-diagnostic system that flags any technical issues quickly, thereby reducing downtime. The standard warranty allows for care-free digging for the first year-and-a-half, or 3 000 hours, whichever is achieved first. 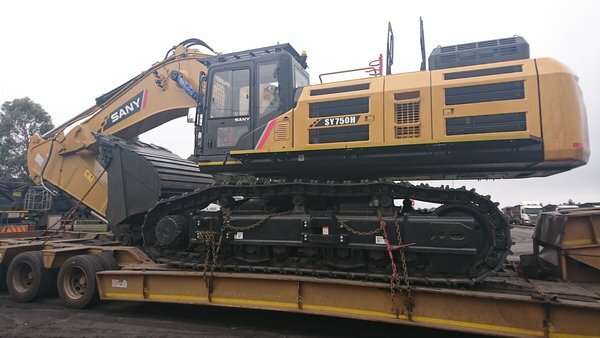 The SANY SY750H has a maximum digging depth of 7 620 mm, and a maximum excavating distance of 12 050 mm. The excavator’s maximum digging height is 11 200 mm, and its maximum dumping height is 7 250 mm. Its 7 m boom and 3 m arm translate into a bucket digging force of 402 kN, and an arm digging force of 345 kN. The GEM eMalahleni branch is ideally located to service the Mpumalanga coalfields region, with a two-hour response time for any breakdowns or technical issues at E&J Construction’s operations. Sampson stresses that the SANY SY750H has an impressive 8 000-hour lifespan, with 250-hour maintenance intervals to guarantee maximum productivity and efficiency. To download hi-res images for this release, please visit http://media.ngage.co.za and click the Goscor Group link to view the company’s press office. Industrial equipment group Goscor, part of the Bud Group, is built to grow. Goscor represents leading equipment brands across several sectors. These include Crown, Doosan, Bendi and Hubtex (forklifts and materials handling equipment); Bobcat (compact & construction); SANY (earthmoving); Tennant, Elgin, Maer, Delfin, Kaivac and HighPoint (industrial cleaning equipment); H-Power, Weima, Meiwa, CSI and Rato (industrial power solutions); Genie (aerial lift equipment); Sullair and Ozen (compressed air solutions), and many more.